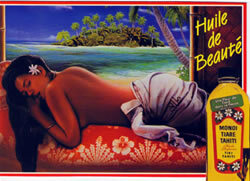 Like everything about Monoi de Tahiti how it obtained its Appellation of Origin is a story. It all began in 1988 when the four largest producers of monoi in Tahiti ( Parfumerie Tiki the oldest and original Monoi since 1942) came together to form the Union of producers of Monoi. Their principal aim was to restore the superior reputation of Polynesian Monoi by fighting against imitations , poor quality coconut oil , more often than not drowning in exotic perfumes from any and every country. At best these fakes smell like monoi but have none of the virtues of this unique cosmetic product. What is more, than 80% of the monoi sold in France is not authentic. In order to combat this plague of fakes and gain official recognition of the special qualities of monoi produced in French Polynesia, Polynesian authorities decided that same year to create an official definition and to regulate its use by voting into local law (no. 350CM). This established two type of monoi: traditional monoi made from grated fresh coconut (known as mamas monoi) and commercially produced monoi made from refined copra oil. This recognition has set a precedent in the world of French cosmetology. Another four years would go by before the union succeeded in creating a trademark to enhance the value of this uniquely Polynesian product. This trademark sets out the selection criteria for the primary materials, the manufacturing process to be followed , and quality standards. By a Decree passed on the 1st of April 1992, “Monoi de Tahiti”, Label of Origin (Appellation d’Origine, AO) was created. This the first time a cosmetic product has been recognized in this way. The Monoi de Tahiti AO Label guarantees the quality of the product and the Polynesian sourcing of its ingredients. The terms of the label indicate very precisely the manufacturing process to be followed. 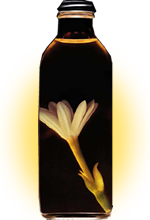 Monoi de Tahiti is obtained by steeping tiare flowers in refined copra oil that has been extracted from coconuts harvested in the geographic region of French Polynesia as ripe nuts, grown in soils of coral origin. These nuts be from the Cocos nucifera and the tiare flowers must be the species Gardenia tahitensis (following Candolle’s classification) harvested in bud form, (decree 912-30) . Any product containing Monoi de Tahiti is required to mention in its list of ingredients “Cocos nucifera” and “Gardenia tahitensis”. The labeling of products using Monoi de Tahiti is also protected. The product first must contain a minimum concentration of Monoi de Tahiti , which will vary depending on the product. The label also requires that when transported in bulk , Mondi de Tahiti (AO) must be stored in cubicontainers or barrels suitable for food storage. with the Year of the Pig. Can’t make up your mind which island to go to…we have been to most of the islands in French Polynesia and atolls and so far our all around favorite is Huahine. Keep in mind…there is really no night life in the islands. Nor are there malls or shopping centers…if this is what you are looking for you should probably go elsewhere. Diving, snorkeling , sunbathing, walking , hiking and biking are what should be on you agenda. TAHITI – a place to escape to, a unique lure to the romantic. Tahiti gets a bad rap from many travel books. “They advise visitors to go straight to Bora Bora or Moorea.,” but they miss out on so much by doing that. We love Papeete, French Polynesia’s laissez-fare capitol, which is often ignored all together. Papeete has one of the finest waterfronts in the South Pacific. Tucked neatly in between a horseshoe bay and the towering peaks of Aorai and Te taraomaiao, it is scenic and vibrant with life, providing an interesting contrast to the luxury resorts with manicured gardens and manufactured beaches. If you decide to stay in downtown Papeete which for us is a must stay at Hotel Tiare Tahiti. The view is gorgeous and it is centrally located to everything . The staff always make us feel at home. We never go to Tahiti without staying there for at least 3 or 4 days. 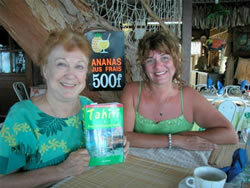 As always I recommend, Jan Prince’s travel book “Tahiti & French Polynesia Guide” now in its fourth edition. In my opinion the best travel guide out there on Tahiti. We have been to French Polynesia many times and I still bring it with me on all of our trips. On one of our visits to Moorea we met Jan and a Tahitian lady friend of hers at Aito Restaurant on the lagoon side between Cook’s and Opunohu Bay. Jan is quite delightful and has a never-ending amount of stories and adventures of her over 30 years in French Polynesia. “Heiva I Tahiti is undoubtedly the most famous of all cultural festivals. This big traditional celebration runs for a month and includes the National Holiday of July 14. Events include, best artistic groups with singing, dancing and their fabulous costumes. Sports contest, which include canoe racing, javelin throwing, stone lifting, cobra preparation, etc. The Craft Heiva runs at the same time and all forms of craftworks from the five islands are represented. We have been to both Heiva’s and they are a wonderful representation of these warm loving people and their culture. In a closing note: Parfumerie Tiki’s Monoi and Tamanu products are the Best of Tahiti’s Native secret for beautiful skin. All natural monoi and tamanu, in the creams, oils, lotions and balms. with very little else added. Recently, here in the United States, stores are popping up advertising Monoi and Tamanu in their products boasting its wonderful blend for hydrating and healing. The name Tahiti on a item itself is wonderful form of marketing yet very little percent of monoi or tamanu is added to these products and the ingredients is lengthy and anything but natural. At Tahiti-Iti.com our main objective is to bring to the world these wonderful products made simply and as natural as they should be. If you want to experience all the benefits of the Tahitian Vahines secret to beautiful skin and shiny soft hair use the products made in Tahiti at Parfumerie Tiki since 1942. There is no comparison. Again, as always we thank Parfumerie Tiki for its consistently great product line and all of our many customers worldwide: old and new.